If you’re looking to become an apex predator in the sportfishing world, the Hatteras 70 GT convertible can help you do it. 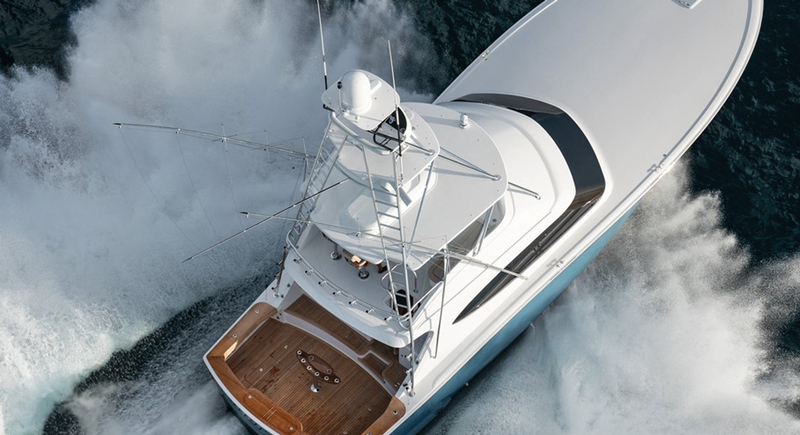 I knew the moment I stepped aboard the Hatteras 70 GT convertible that it was one seriously heavy-hitting sportfishing battlewagon—because it didn’t move one iota. Nor could I get it to rock by quickly moving across the beam, climbing the ladder to the flybridge, or moving from seat to seat on the mezzanine. With 60 tons of displacement and 73’8” of LOA, this is one serious chunka-chunka-beef. 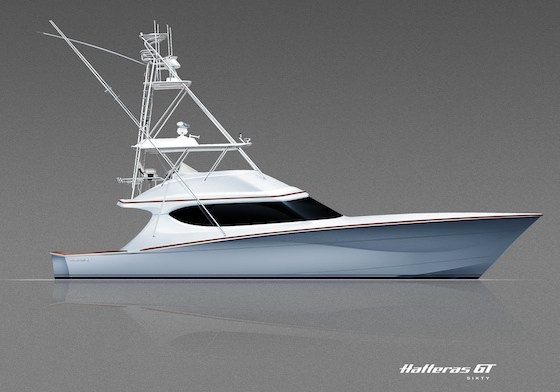 The Hatteras 70 GT: it's 120,000 pounds of luscious, fish-slaying fiberglass. 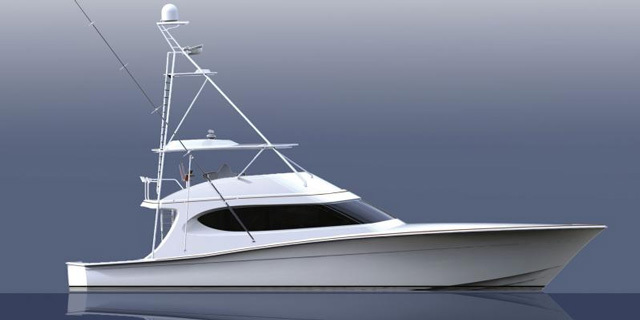 Hatteras is known for building boats that can take you through the rough stuff in comfort, and the 70 GT is designed to continue that tradition. Along with that monstrous amount of mass the hull has gobs of flare in the bow, with a convex variable-degree design that tapers to nearly flat at the transom. It’s the same pattern Hatteras has used in the past to tame the wild inlets and big rollers of the North Carolina coast. Where you’ll first notice a departure from the Hatteras of yesteryear comes in the cockpit. There’s a bit more emphasis placed on designing the mezzanine seating to actually be comfortable, as opposed to seeming like an after-thought. Most big sportfishers have been trending this way, including the rest of Hatteras’s GT series, but on the 70 GT it’s been taken to the next level. Note that the triple-wide settee on the starboard side not only sports arm rests with cup-holders, but also has an adjustable center arm rest/cupholder. It’s a move taken straight out of the pontoon boat playbook, and it’s a smart one even if the original idea was dreamt up by a bunch of sweetwater inlanders. Nor does building in the big settee force you to compromise on fishing; the lower level of the mezzanine serves as the usual cockpit stowage compartments, and there’s a large raised unit to port so you can rig baits, grab ballyhoo, or access your tackle without bending over. A livewell can be found in the transom, and there are rod holders running down the wings as well as rocket launchers on the pipework. You expect the interior of a yacht like the 70 GT to be comfortable, but that attitude extends into the cockpit on this boat. While the cockpit is my favorite spot on any fishing boat, in this case the cabin certainly deserves some attention, too. 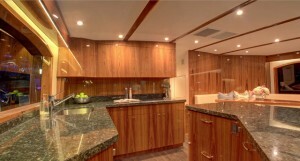 Hatteras placed the galley forward and to port, with a large island doing double-duty as a bar, and positioned a raised dinette to starboard. This leaves the aft section of the saloon open for the settee and entertainment center, and it gives the main cabin an open, flowing feel. Call it Feng Shui in a sportfishing machine. The lower cabin can be configured in a couple of different flavors, but the important points remain the same: the master is just forward of amidships, a guest stateroom is in the bow, and kids and crew get to choose from a number of singles. That’s all well and good, but IMHO, the best room in the house lies behind a door in the port-side companionway: swing it open, and you’ll discover a dedicated rod locker. Thank you, Hatteras, for remembering what the boat’s all about in the first place. Thick, glossy varnish glows on the belowdecks woodwork. 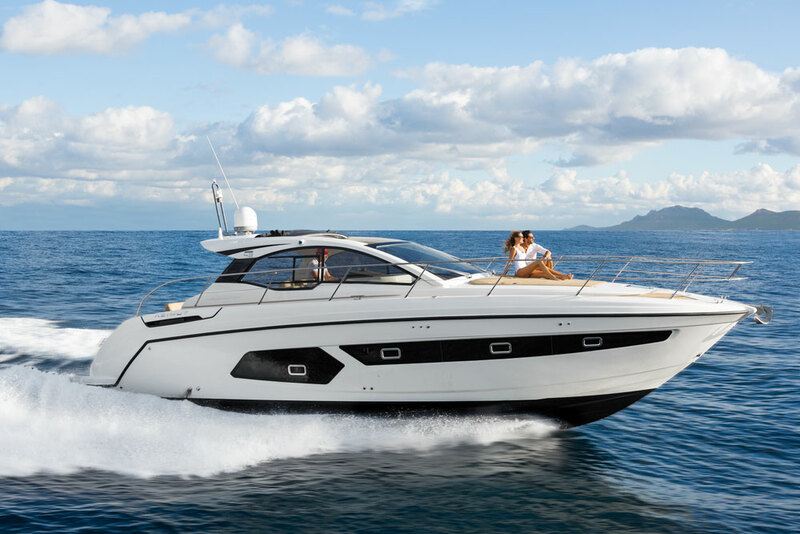 Throughout the interior the GT 70 is kept light and airy with the use of lots of high-gloss woodwork, granite countertops, and bright fabrics. The saloon also benefits from a huge aft window as well as the usual side windows. 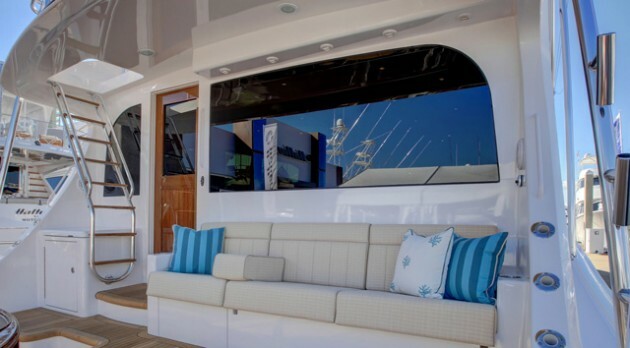 To maintain its sleek look Hatteras eschews the hullside windows that have become popular on many boats lately, to bring natural lighting belowdecks. And they’ve also stayed away from the large sliding glass doors many builders now use as an aft bulkhead. Whether these trends will encroach into the sportfishing market remains to be seen, but in this particular case, although it may leave some people wishing for more natural light in the cabin, I’m glad they didn’t. More windows and big sliding doors can add to maintenance headaches down the road, particularly if the boat’s used hard. And a boat like the Hatteras 70 GT is going to face more flying salt spray and rough weather days than most other pleasure boats of its size. We anglers don’t like giving up a day of fishing, and if that means charging through white-caps for a few hours, so be it. 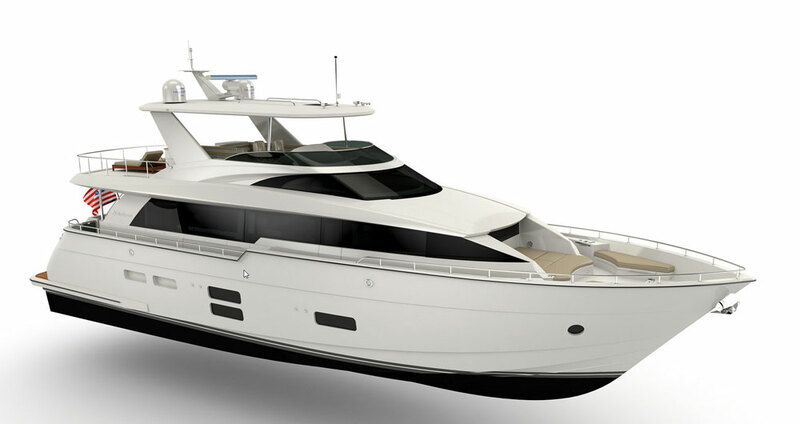 At least it’ll be fun—the 70 GT breaks 41 knots, and can cruise in the mid 30’s. That rivals or exceeds the speeds of most outboard-powered fishboats, much less the average twin-diesel inboard. How does Hatteras get a boat this big to run that fast? Horsepower, of course. Lots and lots of horsepower, twin 1,900 HP Caterpillar Acerts in this case. But that’s not the entire story. The high speed is also made possible due to the boat’s construction. The 70 is resin-infused, which eliminates excess resin and maximizes the strength-to-weight ratio. It may sound like a heavy boat when you recall the weight of 120,000 pounds, but note that the old Hatteras 68 Convertible tipped the scales at 140,000 pounds. What about pricing? 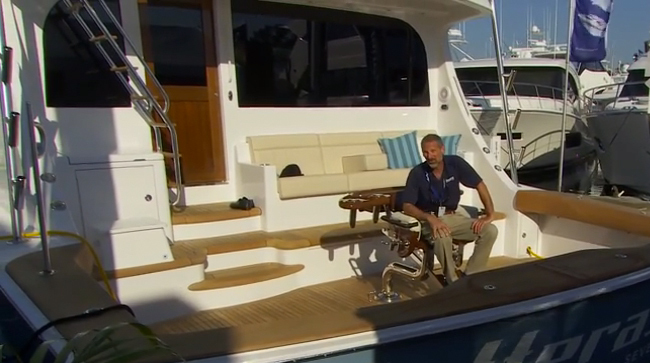 Hatteras didn’t want to get too specific when I saw the boat at the Fort Lauderdale show, but the $4 million dollar figure was whispered around here and there as a starting point. 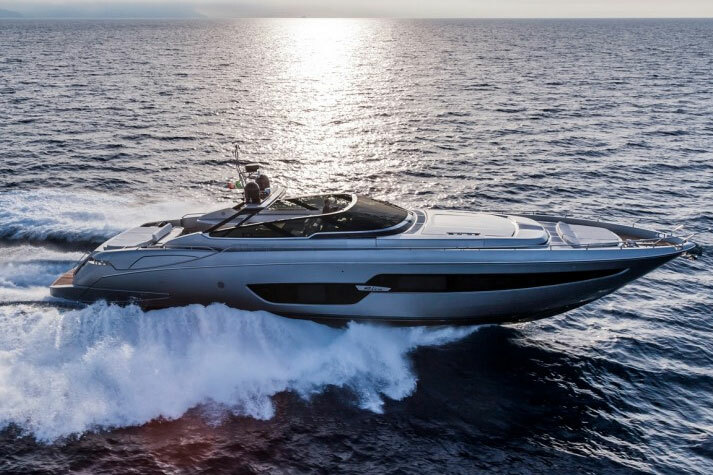 Of course, once you reach this class each boat—yacht, really—has a degree of customization to it, and that can change the cost quite significantly from hull to hull. One thing that will never change: If you dream about being at the top of the food chain, fishing from a Hatteras 70 GT will get you there. Fuel capacity 2,000 (+785 optional) gal. 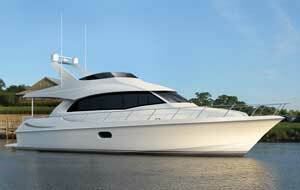 Other Choices: Interested yacht shoppers might also check out boats like the Bayliss 73, and the Spencer 70. See Hatteras GT series listings. 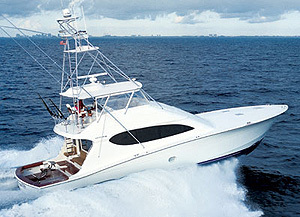 For more information, visit Hatteras Yachts.